DISCLAIMER: The following review is of a game that contains adult sexual situations and contains links to NSFW material. Reader discretion is advised. Visual Novels are a medium that I have come to adore over the last ten years or so. While the medium certainly has its ups-and-downs, the stories and characters are often more than memorable enough to make up for any lack of interactivity that may arise. While certainly not for everyone the genre does have its charms. Much like regular games, every so often there comes that one Visual Novel that resonates with you for some reason. A game that makes you think and dwell on the themes present and makes you ask questions. A game that challenges your perception of the tropes that it utilizes. A game where, in this case, you are the only boy attending a school entirely for girls. That game is Princess Evangile. Get ready to enter a garden of sheltered maidens as you try to save the school they attend. 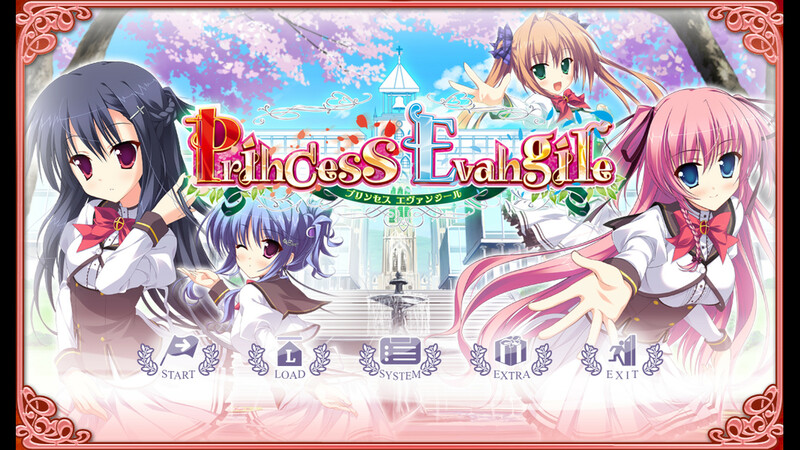 Princess Evangile was released on July 29, 2011, in Japan by MOONSTONE. If that name sounds a bit familiar it’s because MangaGamer has also released Imouto Paradise which is part of MOONSTONE’s “Moonstone Cherry” imprint. MangaGamer has also announced that they will be bringing over another MOONSTONE game, Magical Marriage Lunatics!! in the future. As for Princess Evangile itself, there are quite a few interesting things to go over. 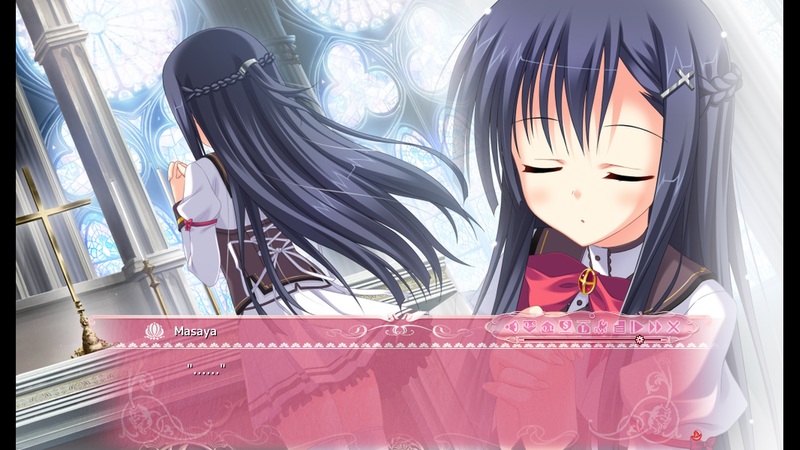 While the original PC release of Princess Evangile was an Eroge, It did well. In fact, the game was ported over to the PSP in 2012 as Princess Evangile Portable, which removed the H-scenes. The PC version was also ported to iOS and Android in Japan, however, VNDB lists these as 17+ releases. Thus, I assume the Eroge bits were excised. 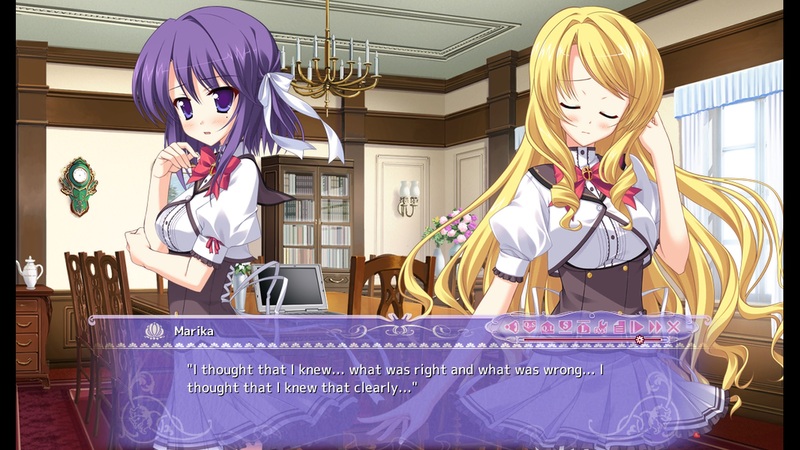 On March 27, 2015, however, MangaGamer released the English version of Princess Evangile in two different flavors. There was a Steam release which is the All-Ages version, and then there is 18+ Eroge release which is available from MangaGamer’s website and Nutaku’s online store. Things don’t end there, however. Princess Evangile’s Limited Edition which was released on December 28, 2015, and is what I used for this review. 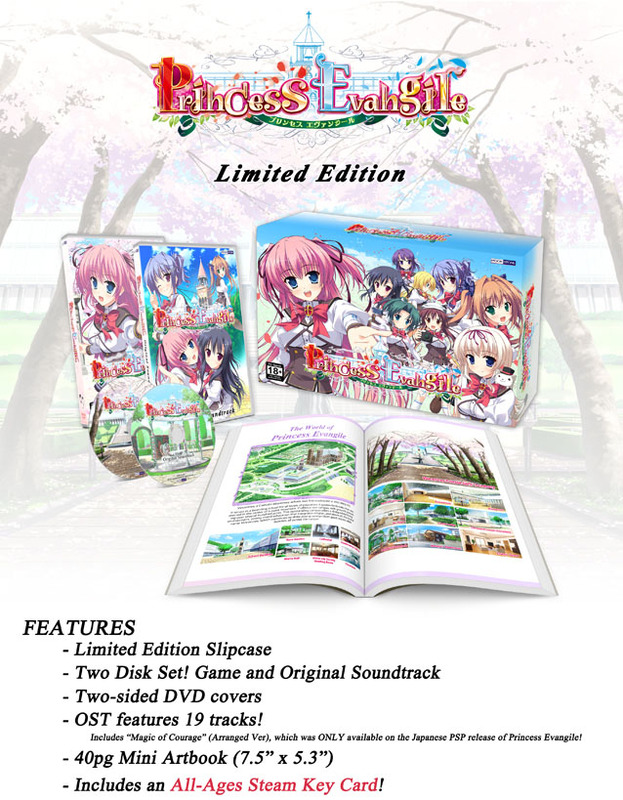 On December 28, 2015, MangaGamer released a Limited Edition hard copy of the game. This version included not just a physical copy of the 18+ version, but a Steam key for the All-Ages version, the OST, a 40pg mini-art book and came in a very nice slipcase that I wish MangaGamer would use more often when making these editions. While this alone could point to how successful the game was here, MangaGamer then released its sequel, Princess Evangile W Happiness on July 28, 2017. As you can see the game’s done quite well for itself and I’m disappointed I didn’t play it when it originally came out. However, with W Happiness launching I figured now was as good a time as ever to see what all the fuss was about. So let’s delve into this properly by discussing one of MOONSTONE’s greatest strengths, its visuals. One of the distinct things about MOONSTONE developed games is the color pallet they use. While bright colors are common in Visual Novels, there’s just something about the pallet that MOONSTONE uses that makes their games really pop. Princess Evangile is no exception here. Everything feels lively, vibrant, and colorful. In addition, the game makes good use of several visual effects. These include transitions, eye-catches for the mid-chapter markers, and even fluttering cherry blossoms. 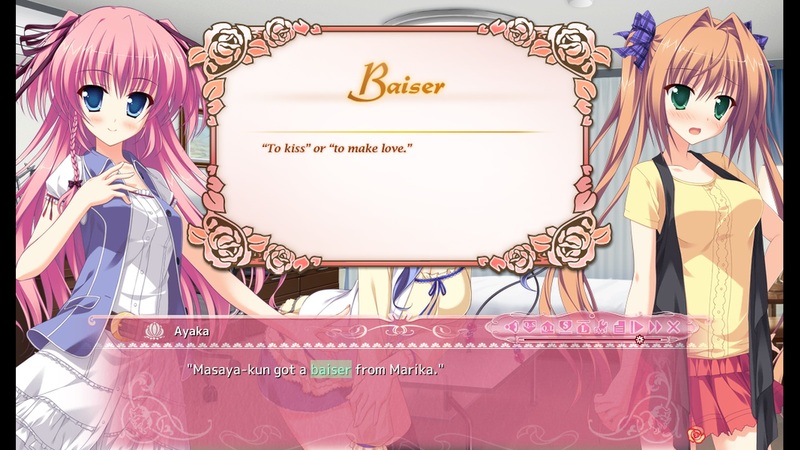 The game does have its own unique visual style, which is just one way it sets itself apart from other Visual Novels. Another way? It’s music and voice acting. MOONSTONE really knows how to bring visuals to life. I mean look how awestruck Masaya is here! Let’s start with the soundtrack. One of the good things here is that each of the four main girls has their own theme and each fits very well. Ritsuko’s, “Elegant Thorn”, is very gentle, slow and brings to mind the image of a proper lady. “Always at Own Pace”, the theme of her Ritsuko’s sister, Ayaka, conversely is a much more upbeat, happy, and just fun like her. And that’s not even getting into the opening and ending themes of “Magic of Courage” and “The Cherry Blossom was Watching”. Thankfully the excellence doesn’t end there as the voice acting is really good as well. Everyone turns in an impressive performance with Ritsuko, Ruriko, Konomi, and the Headmistress’ voices being some of my favorite from the game. Speaking of which, let’s talk about the game’s design and narrative flow. Text highlighted in blue can clicked on to bring up a definition of the term. This is really useful when you consider that this game is 40+ hours and a lot of the terms are French. While Princess Evangile doesn’t do anything revolutionary in terms of Visual Novel design, it does utilize the medium’s elements well. There are two things I specifically want to note in regards to the interface though. The first is that occasionally you’ll see a term highlighted in blue. These can be clicked on to bring up an explanation of what the term means. This is useful to remind yourself of what certain phrases or titles means as Princess Evangile utilizes French for certain terms and character titles. The second thing deals with perspective and is used quite well. 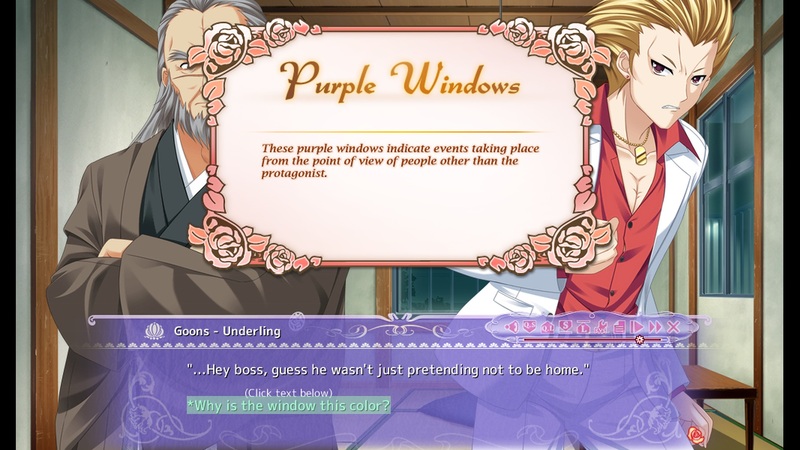 These purple colored windows are something I really like about Princess Evangile. Being able to see the story from different perspectives helps show how everything is connected. Normally your text window will be a Rose Pink color. This means the action is occurring from the main character’s perspective. Occasionally the color will shift to purple which means we’re seeing events that Masaya, the main character, is not present for. This is done to clue the player into events and conversations that they would otherwise not be privy to. I quite like this approach. All too often a Visual Novel can fall into the trap of clunky exposition due to needing the main character present for such discussions. This approach allows Princess Evangile to tell its story in a more natural way. Where some could take issue, however, is with the game’s routing. Namely in how simple it is. Case in point, a lot of early perspective shifts revolve around Marika and Mitsuki. This allows us to see their own internal struggle as they try to decide what to do regarding Masaya. Princess Evangile is not a grand adventure of choices. You can break the game’s decision points into three groups and only one is important to the game’s routing. The first three choices don’t affect gameplay and are just different outcomes for situations. Choices four through seven make up the second group. These are a simple choice between the four main girls. Just pick the one you wish to date and stick with it. The final set of choices vary per girl and are related to their H-scenes only. These have no bearing on the plot either. So, as you can see, this is a pretty light game when it comes to interaction. That just means the game needs to make its route’s memorable then and it does a spectacular job of that. There are four routes, one for each of the main four girls. These are Rise, Chiho, Ritsuko, and Ayaka. 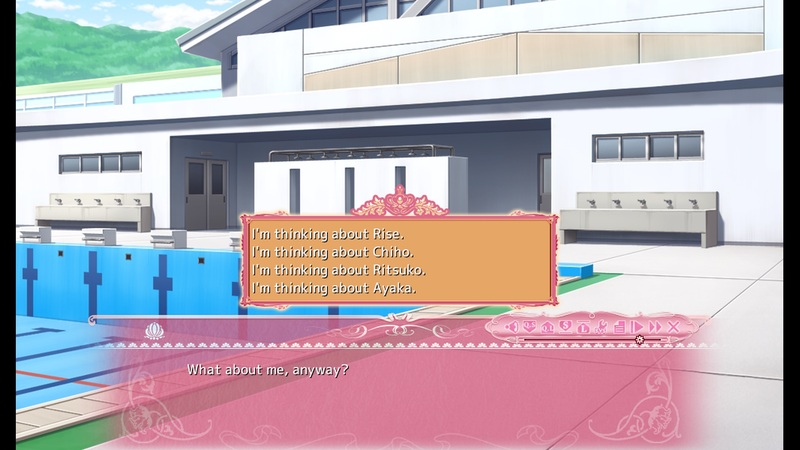 The number of routes is a bit light and one complaint I have is that another character, Ruriko, does not have a route despite the narrative practically establishing one for her. I almost wonder if her route got cut at some point during development. That said, these four routes are well done. Choices, where you have to select a particular girl, are the only ones that matter as far as routing is concerned. The game is broken up into 26 chapters per playthrough. Chapter 1-16 are considered the common route, with Chapter 17-26 making up each individual route. This means there’s a total of 56 chapters in all to read. Which is quite a lot. 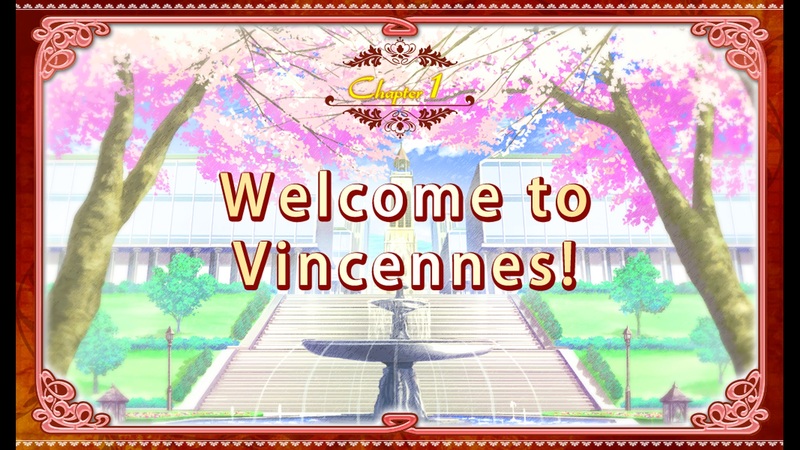 Thankfully each chapter is paced well and since the events of the game take place over the school year, the game uses a calendar to help the player keep track of what day it is and what events are coming up. This means you never feel lost while reading through the narrative. Which we should finally touch on because the plot of Princess Evangile, while very cliché at first glance, has a lot of hidden depth. So let’s take a look at that and the characters on page 2.